Tag Archive | "North Kent Mechanical"
The Community Building Development Team installed a new clock tower at the corner of Main and Maple Streets this week, a perfect accent to the new Cedar Springs Community Library. 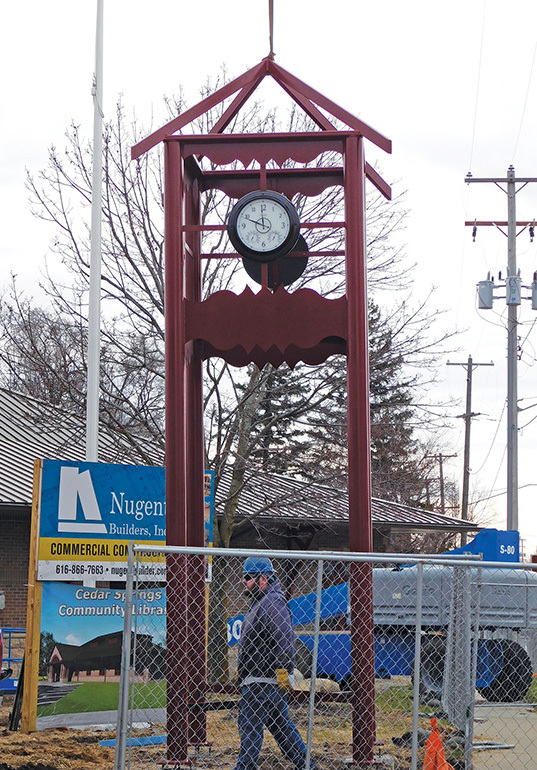 According to CBDT president Kurt Mabie, Dale Larson, of North Kent Mechanical, made and donated the clock tower, which would have cost the CBDT thousands of dollars to purchase. The dark red paint perfectly matches the accent on the new library, as well as the Cedar Springs Brewing Company across the street. Jerry Gebhardt, also of North Kent Mechanical, oversaw the design and building of the tower, which is 20 feet high. Mabie said the current clock faces are only temporary, and they are working with the American Legion to get other faces that may honor veterans. 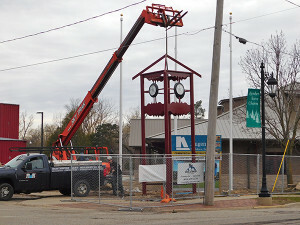 A new clock tower was installed this week on the northwest corner of Main and W. Maple St.